1. Add cut vegetables to bottom of slow-cooker. 2. Place chicken into pot on top of vegetables. 3. Sprinkle seasoning, garlic, bay leaves and pepper on chicken. 4. Pour broth over chicken. 6. Carefully remove the entire chicken and let cool a bit. Remove the meat from the bones and add it back into the slow-cooker. 7. Stir the meat into soup and serve. If desired, add egg noodles to the slow-cooker when the meat is added back in. Cook for another 10-15 minutes until noodles are done and serve. To make chicken and rice soup, cook white rice separately and mix into each bowl of soup when served. Yum looks delicious. I want to read Animal Vegetable Miracle and need to check out local farms for meat. Thanks for the recipe! We have tons of great farms around here, you know. And I definitely recommend that book. It was a bit preachy at times, but I found a lot of great ideas and advice in it. It sounds great. You know, though, that if you say "remove the meat from the bones and add it back to the pot" SOMEONE is going to think you mean the bones? :P Apparently, Dear Abby told someone years ago to put "a cup of water" inside a turkey before cooking. They wrote her back complaining because the measuring cup holding the water melted and ruined the turkey. Hopefully that made you laugh. 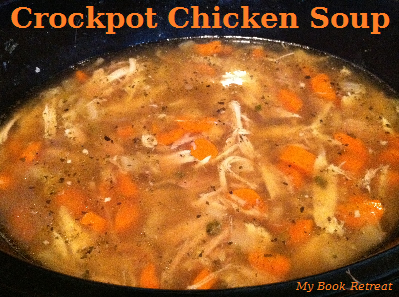 :) The recipe looks good, and since we need to kill one of our roosters this weekend, I'm thinking some chicken soup is in my near future! I've made this with rooster too. Not as much meat, depending on the size of the bird, but still yummy!